BIO-Logic, Inc. can provide a detailed Statement of Qualifications and staff resumes upon request. We are dedicated to providing quality natural resources consulting to government, industry, and private landowners. BIO-Logic, Inc. has been providing professional consulting services throughout Colorado and the Western United States since 1991. Principal/Senior Biologist Steve Boyle holds a Master's degree in Wildlife Biology (Colorado State University, 1981) and has 28 years of experience in wildlife research, management, and conservation planning in Colorado and the western U.S. Mr. Boyle founded the company in 1991 as BIO-Logic Environmental. In 2008 the company became incorporated as BIO-Logic, Inc. Since founding BIO-Logic Mr. Boyle has led biological field surveys and written impact analysis reports for more than 50 projects involving electric transmission line siting and reauthorization, oil and gas development, buried utility siting, land transfers, and terrestrial and aquatic habitat restoration projects. For these projects he has performed agency consultations, designed and led biological field studies, and prepared Biological Assessments, Biological Evaluations, and NEPA document sections. Mr. Boyle has prepared regional conservation assessments for the U.S. Forest Service including Management Indicator Species assessments for the San Juan National Forest and species assessments for Region 2, and prepared a Sagebrush Conservation Assessment & Strategy and Gunnison Sage-grouse conservation agreement documentation for the Colorado Division of Wildlife. As former Senior Wildlife Biologist for AGEISS Environmental, Inc., Mr. Boyle was Principal Investigator for research projects on pronghorn, feral horses, bats, and bird communities at U.S. Army Dugway Proving Ground, Utah . Mr. Boyle authored a Training Area Management Plan at DPG and provided expert consultation on vegetation community changes and associated effects on wildlife. Mr. Boyle also has extensive research experience investigating spotted owls, kit fox, mule deer, elk, bighorn sheep, wild turkey, and desert tortoises. He was an invited reviewer of the Colorado and Southwest Regional Gap Analysis Projects, critically reviewing theoretical models linking vertebrate species distributions to habitat characteristics. He performed extensive fieldwork for and co-authored the Colorado Breeding Bird Atlas. Mr. Boyle was certified in Denver Federal Circuit Court in 1999 as an expert witness for wildlife biology, wildlife habitat, and hunting safety. Prior to consulting work, Mr. Boyle was District Wildlife Manager for the Colorado Division of Wildlife, Research Technician for the U.S. Fish and Wildlife Service in Fort Collins , Colo. , and Research Associate of the Department of Fishery and Wildlife Biology, Colorado State University. Steve and fellow wildlife biologists performing an inventory for spotted owls in the Black Canyon National Park were recently featured in a radio story by Paonia's Adam Burke. Listen to NPR's Day to Day (August 15, 2006): Looking for a Spotted Owl in Colorado. Shawn holds a Master of Science degree in Landscape Architecture and Environmental Planning from Utah State University and a Bachelor of Science degree in Natural Resource Planning from California State University at Humboldt. At BIO-Logic, Shawn is responsible for habitat reclamation, wetland and riparian restoration, landscape level planning efforts, and field surveys and conservation planning for natural resources. Shawn has over ten years experience in natural resource research, wildlife and plant inventories, fine scale habitat mapping, regional scale planning design, wetland creation and restoration, and collaborative planning efforts. He has worked with a wide variety of plant and animal species in diverse habitats including conducting detection surveys and radio tracking forest carnivores in northern California; mist netting, banding, and nest searches for endangered songbirds in Texas; working as a wildlife biologist in subtropical forests of Central America; and planning and designing bioremediation wetland systems for arid regions of the western United States. Alison holds a doctorate in plant ecology from the Missouri Botanical Garden and Washington University in St. Louis. Before joining BIO-Logic in the spring of 2009, she worked in California as an Associate Biologist for the Department of Transportation (DOT) where she performed environmental review of roadway projects for compliance with CEQA and NEPA and conducted Section 7 consultation with the U.S. Fish and Wildlife Service and NOAA Fisheries. Alison also conducted wetland delineations and wrote permit applications for compliance with the federal Clean Water Act and the state Fish and Game Code. She is certified in wetland delineation from the Wetland Training Institute. While at the DOT, Alison also developed mitigation projects involving land acquisition and the purchase of conservation easements and wrote mitigation and monitoring plans. Alison also worked as a private consultant for nine years, overseeing a diversity of projects for government agencies, non-governmental organizations, and private clients, with a focus on listed plant conservation and recovery. Projects included experimental field research on a variety of federally listed plant species, the development of a long-term monitoring program for a federally endangered orchid, and analysis and review of long-term community monitoring data from Santa Cruz Island. She taught plant systematics at the University of California in Santa Cruz and worked as a scientific writer and editor. 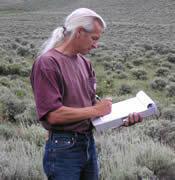 Wildlife Biologist Jim Le Fevre holds a Bachelor's degree in Conservation from the University of Wisconsin-River Falls. He has been a staff biologist at BIO-Logic since 2005, where he has conducted numerous field studies on special status wildlife and plants. Jim has special expertise in raptor biology. He has completed field surveys for nesting raptors including hawks, falcons, eagles, and owls for over 20 projects in Colorado, New Mexico, and Utah. Mr. Le Fevre formerly worked as a raptor rehabilitator in Minnesota and Colorado for 3 years, and was a seasonal biologist with the U.S. Forest Service on the Gunnison, Uncompahgre, and Grand Mesa National Forests for 15 years. For the Forest Service he conducted field studies including pine marten track plate surveys, goshawk protocol surveys and monitoring goshawk nest success. He monitored nesting success of peregrine falcons and searched for new territories; conducted Colorado River cutthroat trout population sampling which included collecting tissue samples for genetic analysis; and performed breeding bird surveys in riparian habitats. He also performed old-growth forest inventories, big game habitat mapping, and vegetation studies. Mr. Le Fevre provided written biological input to a wide variety of proposed management activities on the Forest including timber harvest, road construction, and gas exploration. National Environmental Policy Act (NEPA) Services —Biological Assessments, Biological Evaluations, Environmental Assessments; Biology-Geology-Hydrology-Wetlands sections for Environmental Impact Statements. Endangered Species Act Compliance —research, literature reviews, and surveys for threatened and endangered plants and animals; on-site compliance monitoring for biological resources and wetlands; Section 7 consultation with U.S. Fish and Wildlife Service. Biological Research and Inventory —Field research of vertebrate wildlife including population trends, distribution, habitat use, and management strategies; vegetation studies including floristic surveys, population delineations, and reclamation strategies. Environmental Site Assessments, Geology, and Mineral Assessments —Phase I / II ESA to ASTM Standards; Assessments of Minerals Potential; literature review and surface analysis of geology and geologic hazards, soils, and surface hydrology. Wetland Studies —Jurisdictional wetland delineations, wetland and aquatic habitat assessment and restoration, 404 permitting and compliance. GIS/Conservation Planning —Natural resource inventories and documentation for conservation easements; map-grade GPS data acquisition and GIS resource mapping and analysis; regional conservation planning for special status species and environments.